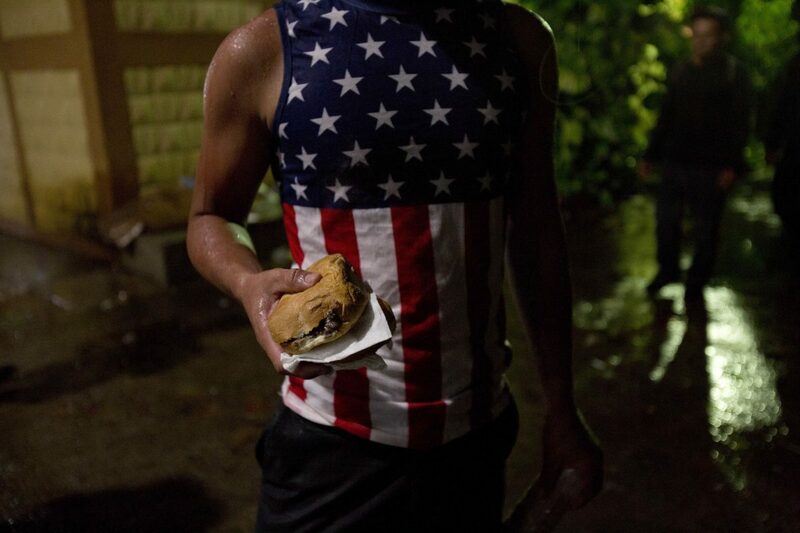 A Honduran migrant wearing a U.S. flag motif shirt, holds a sandwich at an improvised shelter in Chiquimula, Guatemala, Tuesday, Oct. 16, 2018. U.S. President Donald Trump threatened on Tuesday to cut aid to Honduras if it doesn't stop the impromptu caravan of migrants, but it remains unclear if governments in the region can summon the political will to physically halt the determined border-crossers. President Trump has threatened to completely close our southern border if a group of Honduran refugees makes it through Mexico and gets to our ports of entry. While we don’t expect it to actually happen, such a move could devastate our nation’s economy, and nowhere would it be felt more than in Texas. Reportedly, two groups of people, totaling between 2,000 and 4,000, are trying to escape rampant violence and civil unrest in Honduras. To get here they must cross through Guatemala, then Mexico. Trump has issued a series of tweets filled with threats against all those involved. He threatened to cancel all foreign aid to Honduras and Guatemala, “which seem to have almost no control over their population.” He threatened to kill the just-renegotiated trade agreement between the United States, Mexico and Canada if Mexico lets them get here. “The assault on our country at our Southern Border, including the Criminal elements and DRUGS pouring in, is far more important to me, as President, than Trade or the USMCA,” he tweeted. Trump also promised to defy court orders and once again separate Honduran children from their families if they do cross our border. Of course, the idea that any government might even attempt to “control their population” is foreign, and abhorrent, to Americans who champion individual freedom. But it’s reasonable to assume that any effort by Honduras to deprive its citizens of their freedoms actually might drive more people away. We’re sure more stable minds will win out. But what if the borders are closed? The refugees would still come. Closing our ports of entry would only drive them to ford the Rio Grande. Refugees aren’t just seeking a freer and more prosperous life in the Land of Opportunity. Threats of imposed hardship, or the possibility of facing injury or death trying to come here is no deterrent if they face those same risks by staying home. But closing the border could devastate our national economy. Even short-term delays caused by bridge improvements have created noticeable dips in economic activity, according to the Migration Policy Institute. Most U.S.-Mexico trade crosses through Texas, and Mexico is this state’s largest trading partner. The U.S. Bureau of Transportation reported that more than $40 billion in goods crossed our southern border in July alone, with nearly $19 billion coming directly to Texas. That trade includes agricultural products and raw materials for countless types of manufactured goods. Even a short-term closure would cause long-term damage as it would create delays in the completion of manufacturing projects. Produce that is stopped at the border would be irreplaceable, as much of it would perish. That likely would lead to scarcity and higher costs of many fruits, vegetables and other commodities. Bullying foreign countries won’t achieve Trump’s goal of reduced immigration. A better strategy would be to seek ways to encourage reform in those countries, and giving their citizens more reasons to stay home.